Milano expresses a style whose roots lie in the tradition of Made in Italy and the country’s great architecture. A truly “new Italian style” that helps to create real quality, a quality which is expressed in the form of clear, expressive and clean lines, without excess or exaggeration. Veneta Cucine has obtained 'Made in Italy' certification based on UNI standard 11674/2017 and issued by Cosmob and Catas – the two most important Italian laboratories for analysis, tests and certification in the sector of wooden furnishings – which declares the Italian origin of the furniture. Carrera F1 is a new addition to the Carrera line, an iconic Veneta Cucine model based on the Quick Design concept. Veneta Cucine is present at Sposami fair from 12/01/2019 to 20/01/2019 in Catania (Italy). Veneta Cucine is present at Casa Moderna fair from 29/09/2018 to 07/10/2018 in Udine (Italy). Veneta Cucine is present at Casa su Misura fair from 06/10/2018 to 14/10/2018 in Padua (Italy). Exclusive comfort without the condensation. Color your kitchen, discover the new catalogue dedicated to the Veneta Cucine lacquered finishes. For Veneta Cucine, Milano Design Week 2018 was an opportunity to spotlight its new products and the extended range of finishes, materials and colours which have been introduced in order to offer its clients more combinations of colours and materials for each of its products. The CUOA Master Brand Ambassador programme has begun. The advanced financial training course, which is financed by companies operating in the region, began on 5 February. This programme will train new professional figures with the ability to build up the relationship between the brand and the consumer in order to maintain and safeguard the prestige of the "Made in Italy" mark throughout the world. Veneta Cucine is partner of event "Roma Sposa" that will be held at the New Roma Convention Center “La Nuvola” from 18 to 21 January. Veneta Cucine is present at Spaziocasa that will be held from 11/03 to 14/03 and from 18/03 to 20/03 in Vicenza. Veneta Cucine's metal system features a range of innovations which can be applied to all the product's in its range, and is intended to give even greater added value to the design of your kitchen. Veneta Cucine is present at MOA Casa from 28th October to 5th November 2017 in Rome. Veneta Cucine is present at Casa su Misura fair from 07/10/2017 to 15/10/2017 in Padua (Italy). Veneta Cucine is present at Scandicci Fiera fair from 07/10/2017 to 15/10/2017 in Scandicci (Florence). Veneta Cucine was present at the Kitchen & Bath China 2017 that took place from May 31 to June 3, 2017 at SNIEC Shanghai Pudong, China. From the Essence world, a new tendency is born. Cosy Home is the collection that interprets today’s modern trend of “staying home”. Home is a place where the soul of its owner can reflect the way he or she experiences living space, where the layout and the design of the furnishings contribute to enhancing comfort and well-being. It’s a physical space that receives the experiences of the individual or family who lives there and creates essential, indispensable dynamics for defining a layout that is intimately profound. Cosy Home is developed in three inspirations called New Normal, Material Honesty and Solid Elegance. Due to its solid, lived-in style, Metropolitan’s composition is strong, softened by the use of warmer finishes and shades that are available in the range of colours of the models. Veneta Cucine is present at Expocasa fair from 25/02/2017 to 05/03/2017 in Turin (Italy). Veneta Cucine is partner of event "Roma Sposa" that will be held at the New Fair of Rome January 19 to 23. Extra depth makes the kitchen even more practical. Veneta Cucine is present at Salone del Mobile fair from 12 to 14 and from 18 to 20 November in Bergamo. Credenza from Veneta Cucine received “Special Mention” in the "Kitchen and Household" category of the 2017 German Design Award. Veneta Cucine is present at MOA Casa from 22th October to 1nd November 2016 in Rome. Veneta Cucine is present at I Saloni fair from 12/10/2016 to 15/10/2016 in Moscow. Veneta Cucine is present at Scandicci Fiera fair from 08/10/2016 to 16/10/2016 in Scandicci (Florence). Veneta Cucine’s LEGRABOX drawers feature innovative design in which functional perfection and purity of line come together. VENETA CUCINE'S EXCLUSIVE: YOUR SAFETY IS THE FIRST PRIORITY! To remedy the problem of overheating that could develop under the induction hob, Veneta Cucine inserts an insulating panel that allows to keep an adequate ventilation in the whole area. Veneta Cucine is present at Casa su Misura fair from 01/10/2016 to 09/10/2016 in Padua (Italy). Veneta Cucine is present at Casa Moderna fair from 01/10/2016 to 09/10/2016 in Udine (Italy). Stepsystem offers a series of innovations that can be applied to the all Veneta Cucine kitchen models and are capable of further increasing the added value of the design of the kitchen setting and of making domestic life lighter. Veneta Cucine is present at Fiera del Levante fair from 10/09/2016 to 18/09/2016 in Bari (Italy). Credenza by Veneta Cucine has been nominated for the German Design Award. The German Design Award, organized by the German Design Council, has international prestige and rewards every year the prominent novelties in product design and interior design. The competing products are divided into categories and judged by a qualified panel of experts. Decormobel de Payra inaugurated the largest exhibition space in the province of Girona. A whole day dedicated to the event. A day full of surprises for visitors: good music, great buffet and inflatables for children. At stake at the end of the day a beautiful multifunction oven. The “Widespread Excellence: Intensity and Competency” talk moderated by Maria Luisa Pezzali from Radio24 was held on 28th June in the Veneta Cucine showroom. A number of companies in the design, cosmetics and food sectors took part each addressing the subject from its own standpoint. Kitchen & Bath China 2016 was held in the Shanghai New International Expo Center from June 1st to 4th. Veneta Cucine is present at Habitat & Jardin fair from 12/03/2016 to 20/03/2016 Losanna Beaulieu (Switzerland). 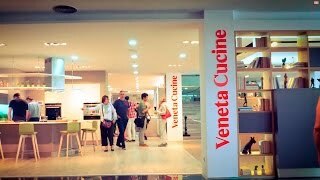 Veneta Cucine is present at HOME fair from 11/03/2016 to 13/03/2016 in Pavia (Italy). Veneta Cucine is present at Expocasa fair from 27/02/2016 to 06/03/2016 in Turin (Italy). The prize-giving ceremony was held in the Veneta Cucine Showroom in Milan on Thursday, February 18, where the winning entry in the Make More competition was declared. Veneta Cucine has obtained Cribis D&B Rating 1. On 19th January at 17.30, at Palazzo Giacomelli in Treviso, the Design Meets Materials exhibition will be inaugurated. The exhibition will include the projects and prototypes created by design students Iuav. Veneta Cucine contributes to the initiative that promotes the culture of design in the atop area of Italian furnishing. The exhibition will hold from 19th January to 19th February with free admission. Veneta Cucine is present at Sposami fair from 16/01/2016 to 24/01/2016 in Catania (Italy). Veneta Cucine announces the launch of a new campaign in which the company re-interprets its "Life Projects" claim, focusing on the unique nature and the truth of our daily life. The hood All-In, produced by Falmec exclusively for Veneta Cucine, is an upgrade of the In-Side hood, already in the market. Mi 20.15 from Veneta Cucine received “Special Mention” in the ‘Kitchen and Household’ category of the 2016 German Design Award. MakeMore, the contest of product design created by Veneta Cucine, organized, on 27th October 2015 in Veneta Cucine Showroom in Milan, the workshop "The roots of design, materials and processes", in collaboration with the Design Department of the Politecnico of Milano and Slow Wood. Veneta Cucine is present at MOA Casa from 24th October to 1nd November 2015 in Rome. Veneta Cucine is present at Salone del Mobile fair from 14 to 16 and from 20 to 22 November in Bergamo. Veneta Cucine is present at Casa su Misura fair from 03/10/2015 to 11/10/2015 in Padua (Italy). Veneta Cucine is present at Casa Moderna fair from 03/10/2015 to 11/10/2015 in Udine (Italy). Veneta Cucine is present at Foire de Marseille fair from 25/09/2015 to 05/10/2015 in Marseille (France). The first edition of Bologna Design Week will be held from Wednesday, 30 September to Saturday, 3 October 2015, with free sponsorship by EXPO Milan 2015, the Municipality of Bologna, the Emilia Romagna Region and CERSAIE. Mi 20.15 by Veneta Cucine has been nominated for the German Design Award. Elisa Gargan tells the project 'Mi 20.15' by Studio Giovannoni. During the Salone del Mobile 2015, at the showroom of Veneta Cucine in Milan, Elisa Gargan tells the project 'Mi 20.15' by Studio Giovannoni. Architect Michele De Lucchi tells the project 'Credenza''. During the Salone del Mobile 2015, at the showroom of Veneta Cucine in Milan, the architect Michele De Lucchi tells the project 'Credenza''. Make the contemporary world more experienced, turning the gaze to a near past. It’s born Atelier Veneta Cucine, a new exhibition format that takes its inspiration from the "creative shop", a place where people know-how can be expressed. Veneta Cucine presents Carrera Plus, extension of Carrera model. On 11th December last year, at the Veneta Cucine Showroom in Milan, Planisfera, the ceiling-mount light designed by KoAI, was awarded first prize at the first edition of MakeMore, a competition organized jointly by Veneta Cucine and MakeTank. Between 11 December 2014 and 6 February 2015, Spazio FMG in via Bergognone, Milan, will be the venue for an exhibition dedicated to the work of one of modern architecture's foremost exponents: Cini Boeri, a leading figure in Italian design. After being nominated in May, Liquida Frame from Veneta Cucine received “Special Mention” in the ‘Kitchen and Household’ category of the 2015 German Design Award. Rating 1, which corresponds to the maximum level of safety, is exclusively awarded to those businesses who have extensively proven their economic and financial stability, as well as the ability to make prompt payments. During BrerArt, the Contemporary Art Week to be held from 22 until 25 October 2014, Veneta Cucine invites the visitors of the show to visit its “Spazio di Milano” (Space in Milan) in Foro Bonaparte, on the corner of Via Quintino Sella. MakeMore Contest: ready for part 2! Graze.com: quick&healthy snack is on line! Milano Design Week is the whole set of events and exhibitions that animate Milan in April’s period in correspondence with the Salone del Mobile’s week. It’s the most the most important design event in the world related to design. Live it with us! Veneta Cucine is present at Tuttocasa fair from 24/04/2014 to 04/05/2014 in Carrara (Italy). Veneta Cucine is present at Fiera di primavera fair from 28/03/2014 to 06/04/2014 in Genoa (Italy).